I was overweight at 16. Food was my best friend. If I had a problem I ate myself through it. You don't wake up one morning and find yourself 73 pounds overweight. It was a gradual process. Food gave me comfort. I ate too much, too often and felt guilty and embarrassed. So I ate more. The health risk of obesity caused constant worry. I had no energy, was physically uncomfortable with limited movement. Couldn't play with my grandchildren. My daughter-in-law saved the day. She saw a TV commercial about people that lost weight with hypnosis. She gave me the number to Inspire Hypnosis in Redding, California. I called and scheduled an appointment for their free hypnotic screening. Don't worry about injuring yourself with grueling exercise. When I started my program I was in no condition to exercise. Inspire Hypnosis had the answer. I started walking 20 minutes a day and gradually increased the time. It's doable, enjoyable and I continue to this day. After a couple of sessions I noticed a change in my food preferences. Now I eat when I'm hungry, enjoy it more and stop when I'm full. It really is that simple. I should mention I still eat ice cream, chips and the occasional pizza. I lost 73 pounds 18 months ago. For the first time in my life I'm keeping weight off with no problem. I lost about four pounds the first week then I averaged two pounds per week, or about eight pounds a month when I reached my goal. My life has completely changed. Now I'm physically comfortable and active. I play with my grandchildren. I go biking and kayaking. I couldn't even get into a Kayak before. But the best part is I Ziplined with my daughter in Oklahoma! My new life also required a new wardrobe. Imagine my delight and excitement when I reached my goal weight and donated every remnant of my former fat-self wardrobe to Goodwill. Inspire Hypnosis offers a free 30 minute hypnosis interview. You meet with your hypnotist and discuss your problem. 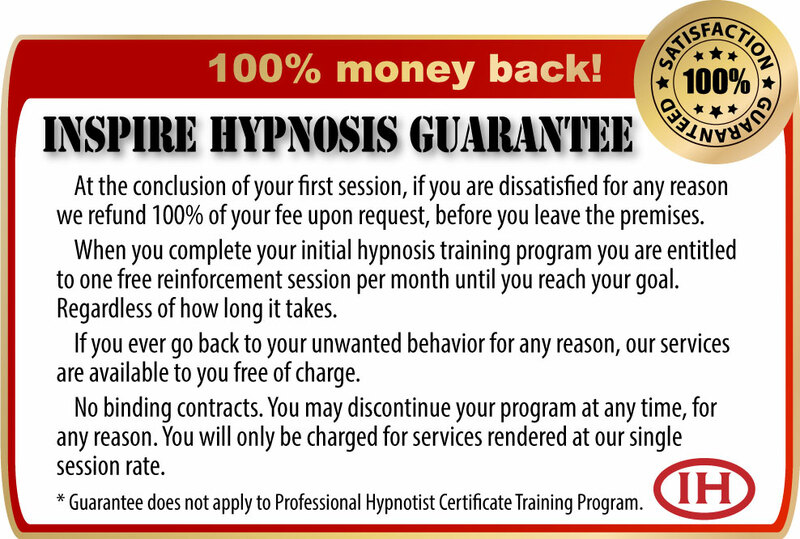 When you qualify for hypnosis, a weight loss program is recommended that fits your lifestyle and most budgets.